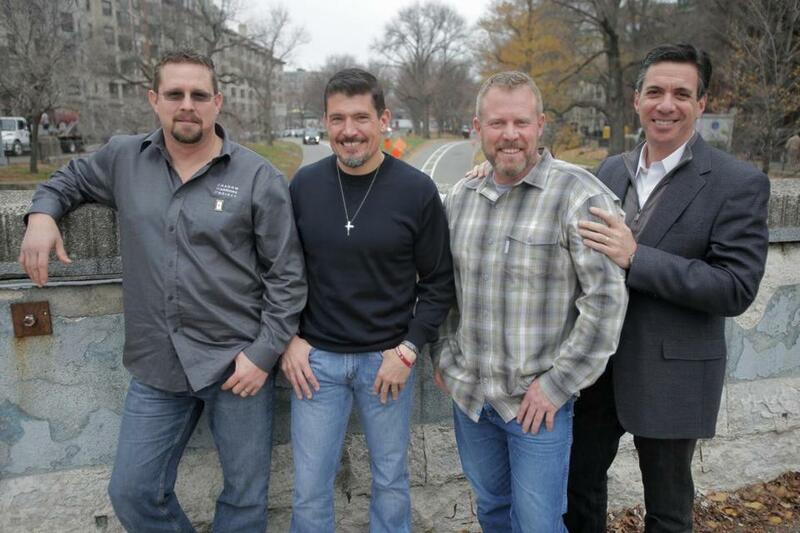 From left: John “Tig” Tiegen, Kris “Tanto” Paronto, and Mark “Oz” Geist were interviewed for the book “13 Hours” by Mitchell Zuckoff (right). As much time and attention as Congress and the media have given to the events of Sept. 11, 2012, the public should know by now what transpired that terrifying night in Benghazi. But does it? To write the book, Zuckoff — a former Boston Globe reporter who now teaches journalism at Boston University — interviewed five of the private security contractors who defended the compound during the attack. (One of them, given the pseudonym Jack Silva, is played by a buff and bearded John Krasinski in the film.) Three of the others — former Army Ranger Kris “Tanto” Paronto, Marine John “Tig”Tiegen, and Mark “Oz” Geist — joined Zuckoff at the Eliot Hotel to talk about the film. Q. To begin, Mitch, tell me how you got these guys to tell you their story. Mitch: It was almost the other way around. Months after the attack, they had stuck together and watched the word “Benghazi” become almost a political epithet and they decided they wanted to tell the story. They wanted to tell it once, and I was fortunate to get a call. I hesitated because I didn’t want to get caught up in the politics, but the first time I met them, it was clear to me they wanted people to know what happened on the ground. Q. Why is it important that people hear this story from you? Q. And only you could do that. Tanto: Yes. I remember being in Yemen and seeing a picture on the Internet showing Ambassador Stevens’s body being dragged through the street. I remember thinking, “That didn’t happen.” I inspected his body when they brought it to us. Somebody put an image on the Internet with a caption slamming the lack of response. That was to serve some political side. That was really hard. Q. It’s one thing to tell your story to someone writing a book, but it’s another to have a Hollywood version of that story. Was there any concern about that? Oz: It was a big concern of all of ours because it’s not like we’d retain any creative control. It’s personal to all of us, but to me in particular because two of the guys who died were standing right next to me. So anything that would bring dishonor to them would hit home with me, and we made that very clear. . . . We understood there would have to be some liberties taken to get this story out there. Things would need to be done to make two hours out of 13 hours. Q. How involved were you in the movie? Oz: It started when Chuck Hogan was writing the script. We got copies of everything before it went to the final draft. Things we didn’t like were fixed to our liking. Tanto: If there was a wrong guy up on the rooftop when an incident happened, that would be something. We need to get the right guy up there. If he did a heroic action up there, that’s the guy who needs to be up there, not someone else because you’re trying to develop a relationship between characters. I remember a wall was in the wrong spot and Tig told Michael. Michael got mad because it was going to cost another $100,000 to fix it. But he fixed it. Q. What was your expectation when you were in Libya? You’ve been in some sketchy situations. Could you imagine this happening? Tig: A couple of months previous, the British ambassador was almost killed. Q. Benghazi is still an issue politically. Do you pay attention? Oz: We’ve all testified to different committees and given the information as we lived it and experienced it. They know it. What they choose to do with it, that’s up to them. They’re trying to use it for political gain. Both sides. I say let’s not worry about the politics. Let’s just make sure it never happens again. Tanto: We’ve done our job and told our story. It’s etched in history with the book and now it’s etched in pop culture with the movie. We’re realistic about the politics. We know it’s not going away. Tig: I don’t think they should stop investigating. You can’t fix a problem without finding out what the problem is. Q. But is there information they don’t have? Tig: If someone was neglecting their duties, they should totally be held accountable. Two people in the State Department got killed because of a lack of security. That’s what it came down to. You’re going to tell me you have no military assets over there and all this Arab Spring stuff is going on? Q. What was your job description? Tanto: To protect CIA personnel and assets, low-profile clandestine protection. We’re not wearing ear pieces, just going out and blending in with the community. A lot of places we go, we’re living in the neighborhood. Mitch: They work for Global Response Staff, which protects the CIA. The idea is that the intelligence officers who are coming out of Yale or Harvard have skills that aren’t necessarily the same skills as these guys have. Q. Has the experience of telling your story been therapeutic? Tanto: I spilled my guts to Mitch. These other guys were a little reluctant. Q. What are your lives like now? Oz: Me and my wife started a nonprofit called Shadow Warriors to support other contractors and their families. What happened to me happened to my daughter and my wife. Tanto: I’m divorced now and a lot of it has to do with this. Your life changes. Mitch: Some people want to disparage these guys as mercenaries. I’m honored to know them. What they’re asked to do in the interest of our country and in the interest of our diplomats, they do it. Sure they’re paid; we’re all paid for our work. Without them, Americans would be in danger all over the world. Q. Have you seen other recent war movies, “American Sniper” or “Hurt Locker” or “Zero Dark Thirty”? Oz: I finally watched “American Sniper.” I think it’s a good movie because it showed something most war movies don’t, and that’s what happens back home. Q. Is it important to you for the film to be a success? Tanto: We want people to know the truth. If it does well, that’ll mean people saw it. Mitch: When all is said and done, these guys are still going to be the heroes of Benghazi. That’s how they’re going to be known. The circus is going to leave town at some point, and we want to make sure these guys don’t end up with a shovel of elephant dung.